The XtremepowerUS Inflatable SUP is an excellent choice for anyone interested in getting started with stand-up paddle boarding. 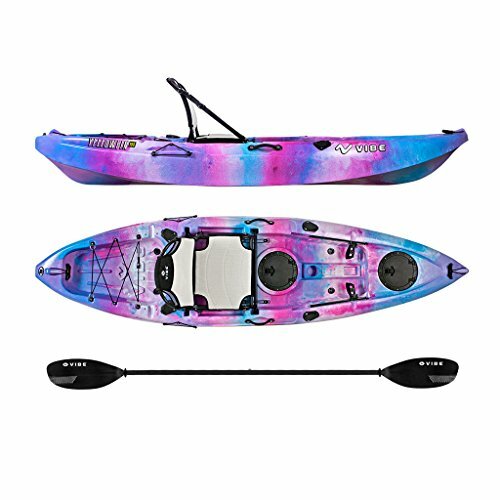 It offers extreme stability and durability that is perfect for beginners and can help you get used to paddling on open water and learning the ropes of this sport. 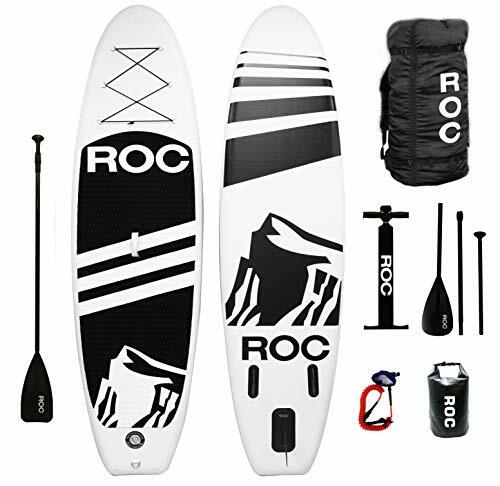 Everything you need for a day out on the water comes with this board, including a pump, patch kit, a carrying backpack, and adjustable paddle. If you are worried that an inflatable board won’t be as good as a standard fiberglass board, the drop-stretch rigidity and iron-hide construction of the XtremepowerUS board will quickly change your mind. The price of this board is also a plus for new riders that might not know if they will enjoy SUP. You can easily spend twice as much on a traditional board, and if you are new, you might not be ready for that financial commitment. Finally, this board is excellent for a broad range of riders because the maximum weight capacity is 300 pounds. Most boards go up to 275, so the XtremepowerUS inflatable SUP goes a little further. You can comfortably fit more than one person on this board, which is exccellent for couples, parents with young children, or friends ready to hit the water! One issue that many riders experience with inflatable boards is a lack of durability, but that is not the case with the Xtremepower US Inflatable SUP. The exterior of this board consists of high-density polyethylene plastic (HDPE) which is a very lightweight and resilient material. The HDPE is also shatter resistant to help protect the polyurethane core. The core is what gives the XtremepowerUS board comparable durability to traditional fiberglass boards. The board also features drop-stretch construction throughout the board. This particular technique will help keep the rigidity of the board, and further protect the HDPE exterior and polyurethane core. Stiffness in a paddleboard is a critical component, especially for novice riders, so they have total control over the board in the water. The XtremepowerUS Inflatable Paddle Board is also lightweight at only 23 pounds. It’s substantial enough to keep riders stable while paddling but still light enough that it doesn’t take as much lower body control as a heavier board might. Another key feature of this board is the fact that it comes with everything you need to have a successful paddle boarding experience. The front of the board has a utility tie-down so you can keep your gear in place while you ride. The tie-down can securely hold your shoes, small backpack, extra paddling gear, and anything else you might need while you’re out on the water. The board also comes with a detachable fin that can help guide you through choppier waters but is easy to take off and store if you don’t need it. There are also handles on the side of the board to make it easy to carry in and out of the water. The paddle that comes with the board is adjustable so no matter your height, you can set the paddle to give you the most control. The paddle also floats which is excellent if you happen to drop it while riding. Also included with the XtremepowerUS Inflatable SUP are a pump and patch kit. If you get a hole while using your board, you can use the kit to make a patch that will hold until you can get the board repaired. Finally, everything comes inside a backpack that makes it easy to pack up all your gear and head out on a SUP adventure. It’s compact enough that you can store it in your car or garage and be ready to go whenever you feel like heading out on the water. Durable construction – Not only does this board have a drop-stretch fabric that allows a smooth and rigid ride, it also has unique iron-hide construction. The HDPE exterior provides a shatter-proof cover for the solid polyethylene core which means this board will last you a long time. Enough space for a few people – The maximum weight this board can carry is 300 pounds. Because of its sturdy construction, two adults could comfortably fit on this board and parents can even bring their children along and still feel safe. Accessories – The board comes with all the accessories you need to have a good ride. An adjustable paddle that floats, patch kit for any emergency repairs, a pump to get your board ready to ride, and a backpack to carry everything. Ready for your gear – The utility-tie downs mean you can bring extra gear along and stay out on the water longer without heading back to shore for supplies. 1-Year warranty & 30-day return policy – If for any reason you are not pleased with this board, you can return it for free in the first 30 days. There is also a 1-year warranty through the manufacturer. As you shop around for the right iSUP, you will inevitably hear from the seller all the notable features and key points of the product. But one of the best ways to learn more about the quality of a board is to look at customer reviews. So, what are customers saying about the XtremepowerUS inflatable SUP? Luckily, it’s mostly positive! Overall, customers have loved this product. Many report they love the versatility of the inflatable board and the fact that they can just keep everything in the backpack in their car. Many customers are also first-time uses and say that the construction of the board has made it easy to learn the ropes of stand-up paddle boarding. Because many of these users are new to the sport, they also like the fact that they can bring another person on the board with them and no one has had any problems with the added weight. While most of the reviews are positive, there were a few things that more experienced riders noticed missing. Most traditional plastic boards come with a leash to help hold onto the board in the water, and this one doesn’t have that. A few users also mentioned that the pump that comes with the board is not as powerful as some other pumps. It could take 20 to 30 minutes to pump this board up, but if you had a stronger pump, it could be a faster process. Other than these tiny details, the board still had great reviews. Many bought this board as a gift for friends and family interested in SUP and have loved the results. The fact that it is lightweight, sturdily made, comes with all the accessories, and makes it easy for beginners to get their bearings make the XtremepowerUS Inflatable Paddle Board an excellent choice. For anyone that is just starting out with stand-up paddle boarding, the Xtremepower US Inflatable Paddle Board offers everything you need. The careful construction of the board, including a polyurethane core covered by shatter resistant HDPE, means you will have this board for a long time and get a lot of use from it. This board does best on calmer waters and comes equipped with utility-tie downs which means you can spend more time using your board out on the water and learning how to SUP. The fact that the paddle is adjustable just means even more people, no matter how tall they are, can get use from this board. For more advanced riders, if you want a paddle board that will go wherever you go, this is a great board. You don’t have to worry about strapping it to the roof of your car because you can fold it up into the included backpack. It still offers a sturdy and comfortable ride, and you can use the detachable fin to fine-tune your ride. The price point on this board just makes it more accessible to riders and allows entry-level customers to try something new without breaking the bank. The fact that the board is built to last just means that you are getting more bang for your buck with the XtremepowerUS inflatable SUP. If you’re ready to try out SUP and need a board that is stable, versatile, and ready to get out on the water when you are, this is the board for you.